Oak Island Fishing Charters was nearshore today trying to land on a hot flounder bite but the toadfish had other plans. During our toadfish rodeo we were catching bluefish and blackbass. So all in all we caught fish but not the ones we were looking for and there was several flounder caught around us. Also the big sharks have moved back in. Today Oak Island Fishing Charters found a school of Spanish Mackerel jumping and biting all over the place on each trip. Sure do hope the fish want to bite again tomorrow. Had a group charter Oak Island Fishing Charters to take his son to catch a shark for his birthday and maybe get lucky and catch a Tarpon. Well the plan came together first fish was a 40lb blacktip shark that put on a great show. 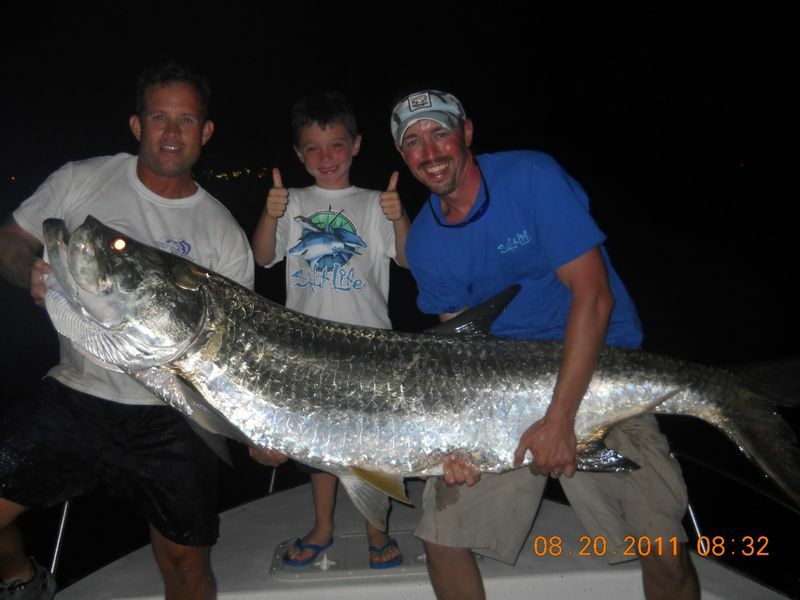 The last fish was a 72″ x 38″ Tarpon and in less than 10 min we were taking pictures. I will post when the charter sends them to me. 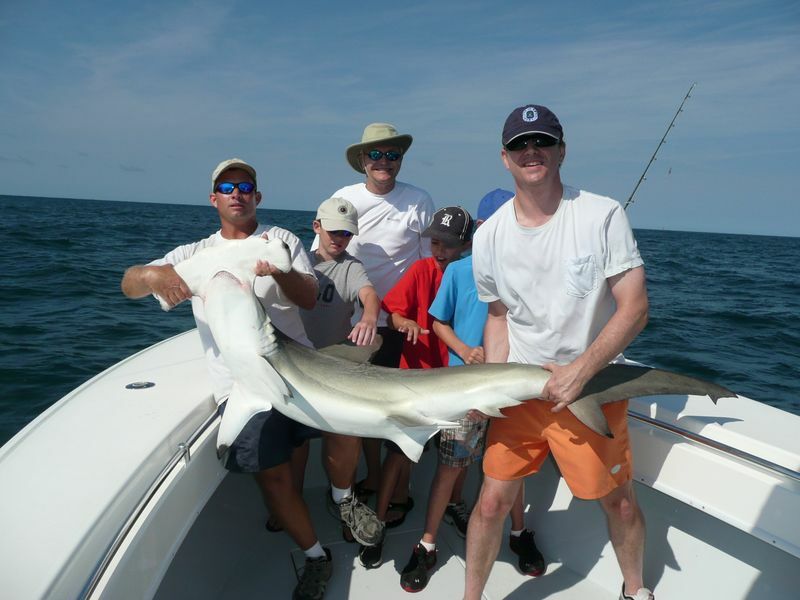 The title says it all for Oak Island Fishing Charters because the shark fishing was great. The morning trip had nothing but Hammerheads including one the almost stretched across the boat (will have pic soon). The afternoon trip stayed busy with nice blacktip Sharks including several that would jump and break our lines. I really don’t see how the nearshore fishing can get any better than it has been this week. Oak Island Fishing Charters was fishing nearshore again this morning and will have to say fishing is pretty easy right now. You can catch all the Spanish Mackerel you care to handle in a short amount of time. Sure hope the King Mackerel act this way in Oct.
Oak Island Fishing Charters went to the stream off Southport today hoping the wahoo were biting like they are up the road and we have yet to see one. We did boat a nice Blackfin Tuna and King Mackerel. Seeing that the stream was slow for us we went Amberjack Fishing and they showed us no mercy again today, at times nobody would even want to reel it in. With sore arms they wanted to catch some little fish so we caught Blackbass, Trigger fish and Gray Snapper. Oak Island Fishing Charters went this morning and caught Spanish Mackerel and a nice Blacktip Sharks. On the afternoon trip we went to the nearshore reefs and caught some nice flounder. Tomorrow we are trying to pull a rabbit out of the hat (hero or zero) stay tuned. Sept. is an awesome time to get in on the action with several different kinds of Sharks. If you have not already booked your trip don’t wait to long.